What homeowner wouldn’t want to save more money on their energy bills? In fact, many households are more concerned about their energy bills than you’d think. In 2015, one in three American households faced difficulty paying their energy bills. Many homeowners struggled to sustain proper heating and cooling in their houses. We’ve all heard of insulation. But what does insulation do exactly? Few homeowners actually understand what insulation does in relation to saving energy. In this article, we’ll explore how adequate insulation can help you save more on your energy bills. After the foundation of the house goes up, installing the drywall is the next step, right? Think again! After someone builds a home, their next step is not only to install the electric and plumbing into the walls. They also have to install material known as insulation. Insulation helps to prevent air and sound from transmitting through the walls. Thermal insulation, in particular, is what most homeowners are somewhat familiar with. It’s not only found in the walls of a home but in the ceilings, as well. It works to keep one side of the insulation warmer than the other. This prevents hot and cold air from seeping through the walls and ceilings and into a home. 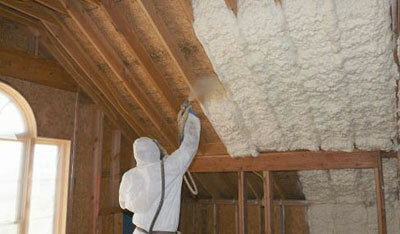 There are several types of insulation, but batt and foam insulation are most common in houses. A batt or a roll is a piece of felt material that lines and insulates walls, floors, and ceilings. It’s typically made with fiberglass, mineral wool, plastic or natural fibers. These fluffy panels work to trap tiny pockets of air within their fibers. Unfortunately, a lot of older structures contain outdated batt and roll insulation. Many homeowners who struggle with high energy bills live in these older structures. There’s also foam insulation, which not only keeps air, moisture, dust, and pollen out. It meets modern building codes and works well with wood, steel, and concrete. Every home is different in the way that it’s built and how old it is structurally. Insulating your home may be unique from how your neighbor or friend insulates theirs. But we’ll share some pointers on how to adequately insulate your home to save more money every month! The East Coast is no stranger to bitter cold winters and scorching hot summers. So, how does insulation work in a state like Connecticut? A house in Connecticut that’s not insulated will feel warmer in the summer and colder in the winter. As a result, HVAC systems will have to work harder, resulting in higher energy bills. If your insulation is old, it may be time to reinstall entirely new blown in or foam insulation. First, consider the insulation in your home’s building envelope. This is the area that’s closest to the outdoors. If this isn’t properly insulated, it’s likely that air is easily seeping through. Because heat rises, it’s always a good idea to insulate your attic. This is especially important for trapping in more warm air when it’s cold. This way, homeowners can keep their thermostats down. Still, heat travels in all sorts of directions. And any home can experience drafts no matter how well their wall and ceiling insulation is. Some homes, especially older ones, are draftier than others. That’s why it’s also a good idea to caulk and weather-strip cracks and gaps to prevent air leaks. Proper ventilation is often a concern for homeowners who are looking to seal their homes. Drafts can raise energy bills. But not getting enough fresh air circulating can create an uncomfortable environment. If your home experiences lots of drafting, talk with a residential insulation expert. They can help you seal your home without compromising the ventilation. Does your home have a heating and cooling duct system? If your HVAC system is relatively newer, this may not be much concern to you. But if it’s an older system, leaking ducts could be causing your system to overwork. Unfortunately, leaking air ducts can prevent air from getting to where it needs to go. As a result, you may feel like you need to turn the thermostat down more in the summer and higher in the winter. By sealing and insulating the ducts in your home, your HVAC system can do a more efficient job. You should also look into sealing the air registers, as well. It may be the case that air is leaking from the registers into the floors and walls. Properly insulating your home is a good place to start if you’re concerned about energy bills. Older homes are more prone to poor insulation than newer ones. There may even be certain areas of your home that need better insulation while you can leave other areas asis. To learn more about insulating your home, talk to the experts at Good Life Energy Savers. We provide residential insulation services in Connecticut and New York. Contact us today to schedule a free estimate!